Apple's expert witness on damages, a certified public accountant from Chicago, was the person who sealed the iPhone maker's victory in its patent infringement retrial against rival Samsung, according to members of the eight-person jury. Jury forewoman Colleen Allen spoke with Bloomberg after the trial concluded on Thursday, and revealed that it was CPA Julie L. Davis who provided the strongest evidence to justify a $290 million payout to Apple from Samsung. Allen called Davis a "superstar witness," saying she was "on it" and steady when cross examined. Allen's thoughts were echoed by fellow juror Barry Goldman-Hall, who said that it was Davis who helped determine exactly how much money Apple should be awarded. A major point of contention for the jury was a sum of $178 million that Samsung felt should be subtracted from profits of more than $230 million attributable to the South Korean company's infringing products. Allen felt none of the money should come out, but other jurors disagreed, and the group compromised by cutting the sum in half. Damages expert Julie L. Davis was a "superstar witness" who helped Apple win $290 million from Samsung, according to the jury forewoman. After two days of deliberation, the jury decided to award Apple $290 million in damages from Samsung, in return for its copying of patented software and hardware. The decision is viewed as a major win for Apple, which was seeking to collect up to $380 million in the retrial. Samsung felt it owed just $53 million. To date, Apple has won more than $900 million in damages from Samsung over the infringement of five patents related to the iPhone and iPad. 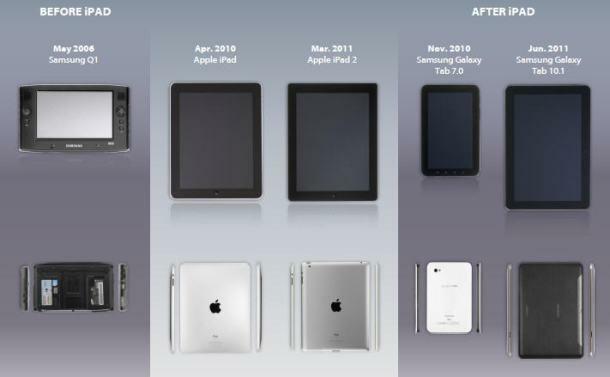 Key evidence from Apple showed how Samsung's smartphone and tablet designs changed radically to mimic Apple after the launch of the first iPhone in 2007 and the iPad in 2010. Though the jury's decision has been made, legal squabbles between Samsung and Apple are far from over, with the two companies set to appear before Judge Lucy Koh once again in March. At that hearing, the two sides will argue over accusations of patent infringement in newer smartphone models, including the iPhone 5 and Galaxy S III. Samsung has also unsurprisingly vowed to appeal the $290 million decision made this week. A spokeswoman for the company told Bloomberg that Samsung plans to "continue to innovate" as it moves forward with the appeal process.